The wheels on Andy's EcoBus don't only go round and round, you know: they go round and round in a sustainable way, even when there's only a handful of us on the lunchtime journey. Driver is good enough to let us alight near Stoke Bridge (Sid Little, engineer) leaving a stroll past DanceEats to a venue that's only recently appeared on the ToDo list. I see Isaacs. Yeah, that's right, I'm not doing the apostrophe. 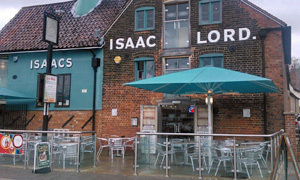 Previously I'd always thought of this place -- the dock-facing part of the Isaac Lord complex -- as a pub, prob'ly from its time as the Malt Kiln stroke Vodka Bar. Weaving past earlier this year on the way to UCS Kai, I noticed the phrase "coffee tavern". Er, OK, you're in and we're here. There's tables out but we're eating in, ta very much. Those parasols are doubling as umbrellas today. All nicely kitted out in here with beams and wood and stuff. Grade I listed, I believe. Up some stairs is the Merchants Bar (and further still, the Top Bar), humming with folks starting their weekend early. We're sticking down here in the Malt Kiln Furness. None of that laminated ten page menu nonsense here: one medium b&w board has everything you need from jackets to fish and chips. Neither of us makes it past item number one, the chicken & bacon sandwich. Big ticks for free Wifi and newspapers, plus local flyers and even Ipswich postcards for sale. My goodness, we've come a long way around these parts. Service is friendly and efficient (did that waitress really pronounce "quay" as "kway"?) as our clubs sarnies appear. Wot no garnish or couple of crisps? No problem, good and tasty anyway. Feel slightly cocooned in here which is no bad thing, staying out of the driving summer rain. From the handful of slices on display, I'll go for the big ol' choc brownie to soak up the Americano. Proper coffee, too. Nothing exceptional but I could easily imagine popping in here for a quick-ish lunch if I was back working in town. If it was a car -- Issigonis Maxi. If they were passing by -- Santiago Cabrera.